July 26, 2018 (New York, NY) –Today, IFP (Independent Filmmaker Project) announced its 40th annual IFP Project Forum slate, highlighting 150 films, series, digital and audio projects in development from over 16 countries. 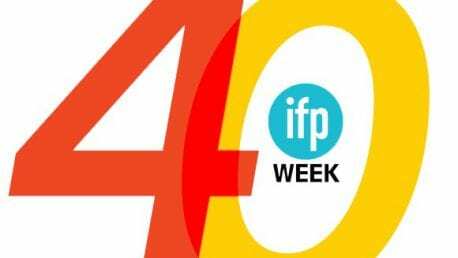 Selected directors, producers, showrunners and audio storytellers will attend the IFP Project Forum during the 40th anniversary of IFP Week in New York September 15 – 20, 2018 in Brooklyn. IFP’s Project Forum is the United States’ only international co-production market featuring stories for all platforms, and hosts over 5,000 artist & industry meetings. In addition, IFP Week hosts a multi-day slate of talks, as well as numerous public screenings, exhibitions and events celebrating the art of bold, risk-taking and singular storytelling in all its forms. 2018 marks the first year that IFP will also be including audio storytelling into the Project Forum, with selected projects meeting with industry leaders, as well as taking part in a live pitch aimed at funders, advertisers, producers and audio platforms on Wednesday, September 19th. Under the curatorial leadership of Amy Dotson (Deputy Director/Head of Programming, IFP) and Milton Tabbot (Senior Director of Programming, IFP), the slate showcases original and provocative work, across a broad range of budgets, genres, emotions and platforms. Selections ranges from highly commercial fare to work that tackles controversial subject matter, introduces wildly engaging and often hilarious worldviews, and challenges traditional forms of film, series and audio storytelling. –New narrative films and series anchored by top producers and EP’s including Lamb on the Throne from Adele Romanski (Moonlight) & Sara Murphy (Land Ho! ), Breezin’ from Amy Lo (Nancy), The Gymnast from Brian Koppelman and David Levien (Billions), The Fugitive Game from Ryan Cunningham (Broad City), Sleepwalk from Ryan Zacarias (A Ciambra), Bitterroot from Giulia Caruso & Ki Jin Kim (Columbus) and Nine Days from Jason Michael Berman (Amateur), Mette-Marie Kongsved (I Don’t Feel at Home in This World Anymore) and Laura Tunstall (Beyoncé’s Lemonade). –New narrative films directed by international auteurs including omnibus film Jerusalem-The Quarters featuring Todd Solondz (Welcome to the Dollhouse), Saint-Narcisse by Bruce LaBruce (Gerontophilia), Centre of the Earth by Gabriel Mascaro (Neon Bull) as well as rising stars with second features currently in post such as Colin Healey’s For Entertainment Purposes, Tom Quinn’s Colewell and Ani Simon-Kennedy’s The Short History of the Long Road. – New series from innovative creators including Radical Eye: The Life and Times of Tina Modotti by Aaron Brookner (Uncle Howard), Watched by Afia Nathaniel (Dukhtar), Dream Team by Lev Kalman & Whitney Horn (L for Leisure), Year Zero by Ruby Marez & Brooke Sebold (Red Without Blue) and View from the Floor by Mindie Lind & Meghan Griffiths (Sadie). –New non-fiction films and series from top producers and executive producers including Jacinta from Dan Cogan (Icarus), Case 993 from Josh & Dan Braun (Wild, Wild Country) and Danny Glover (Strong Island), Princess Nokia from Christine Vachon (Poison) and Untitled Digital Dating Documentary Series from Julie Goldman & Chris Clements (Life, Animated). –New feature documentaries include Betty & Henri by Doug Block (112 Weddings), Cured by Bennett Singer (Brother Outsider), Without Arrows by Jonathan Olshefski (Quest), Narrowsburg by Martha Shane (After Tiller) Pool Movie by Vicky Funari (Paulina), and What It Takes by Deborah Dickson (Lalee’s Kin). Additional programming for IFP Week will be announced in the coming weeks. Presenting a mix of 78 narrative features, series (digital, limited, and traditional) and audio stories (podcast, app or tech based) from development through postproduction, this section includes emerging and established storytellers from the U.S. and over 13 countries. 55% of projects are directed by women; 44% of projects are directed and created by a diverse range of artists. Presenting a mix of 72 documentary features, non-fiction series and audio stories ranging from an early financing stage (i.e. early development/production) to those nearing completion (i.e. in postproduction or rough-cut stage), this section includes emerging and established artists in non-fiction from the U.S. and around the world. 58% of projects are directed and created by women and 34% of projects are directed and created by a diverse range of artists. After over 40 years of discovery new talent, 2018 has been IFP’s most successful year to date shepherding new talents to industry and audiences. Coming off a terrific year that saw IFP projects find success theatrically and in digital release, recent supported projects of note include Elan and Jonathan Bogarín’s 306 Hollywood, Sandi Tan’s Shirkers, Christina Choe’s Nancy, Paula Eiselt’s 93QUEEN, Jennifer Fox’s The Tale, Boots Riley’s Sorry to Bother You, RaMell Ross’ Hale County This Morning, This Evening, Cathy Yan’s Dead Pigs and more. Current and recent shows created by former IFP alumni now on television include Terence Nance’s Random Acts of Flyness, The Duplass Brothers’ Room 104, Moria Demos & Laura Ricciardi’s Making of a Murderer, Ava DuVernay’s Queen Sugar, and Amy Seimetz’s The Girlfriend Experience, as well as many alumni writers, directors, and producers now working in writer’s rooms in the U.S. and around the world. The IFP and IFP Week are generously supported by a group of loyal corporate, foundation and government benefactors. The 2018 Sponsors are Premier Sponsors HBO and Amazon Studios; Platinum Sponsor GreenSlate; Gold Sponsors A&E IndieFilms, Bloomberg Philanthropies, OneFifty, SAGIndie, SingularDTV, Topic Studios, TREETI, Underground Lauderdale/Office of Film, Music, Fashion, Create and Vimeo; and Official Media Partner the Village Voice. IFP Week is also supported by grants from the Ford Foundation, the National Endowment for the Arts, the New York City Department of Cultural Affairs, the New York State Council on the Arts and the Time Warner Foundation.